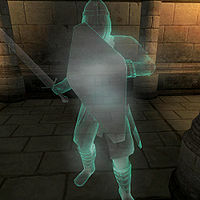 Sir Casimir is a Redguard ghost added by the Knights of the Nine official plug-in. He was a Knight of the Nine long ago. Sir Casimir wears chainmail boots, gauntlets, greaves, and helmet. He also wears a Knight of the Nine cuirass and carries a Knights of the Nine shield. He wields a steel longsword in combat. You will meet the ghost of Sir Casimir in the basement of the Priory of the Nine during the quest Priory of the Nine, where he will give you the quest Stendarr's Mercy. Kellen is a descendant of Sir Casimir. Speaking to Sir Casimir for the first time will have him greet you by revealing that he was the one to lose the Gauntlets of the Crusader. "I know where you may find the Gauntlets of the Crusader, for I was the one who lost them. Though many know where they are, they are still lost. I believe there is something you must do in order to retrieve them. Would you listen to my tale, and learn of the Gauntlets' fate?" Telling him that you don't wish to take up this quest at the moment will have him politely accept your decision: "As you wish." If you agree to hear his tale he will relay to you his story: "When the Order fractured, I followed Sir Berich into war, taking the Gauntlets with me. When it was over, I returned to Cyrodiil. I attempted to return to the service of the Nine, but the war had changed me. I no longer had sympathy for the weak, or pity for the suffering. In the brief time I was there, I did more to hurt the Chapel than help it. It was there that I was cursed." If you tell him to finish up the story he will be offended, but will oblige your command: "Your attitude does not bode well. Nevertheless, you may yet succeed where I failed. I failed to show mercy, and Stendarr cursed me for it. Right my wrongs, show mercy where it is needed, and Stendarr may grant you the Gauntlets. Seek out the Chapel of Stendarr in Chorrol. The priests there can assist you." If you instead ask that he go into detail about the curse he mentioned he will fully explain the events that lead to the gauntlets being lost. "A beggar who came to the Chapel each day for help tried my patience one too many times. I lost my temper, and struck him. My blow landed harder than I had intended, and he fell to the floor, dead. Killed in the very Chapel of the God of Mercy. I left the Chapel at once, of course, but the damage was done. I was weak, constantly weary, and lacked the energy to do almost anything." Asking him about what happened to the gauntlets will have him reveal their fate: "Ah, yes. As proof of the deed, when I struck the poor man the Gauntlets slipped right off my hands and fell to the floor. Heavy as stone, they would not move. None could lift them. I suspect they lie there still, in Chorrol's Chapel. You must prove to Stendarr you are worthy to lift the Gauntlets once more. Seek out the priests in Chorrol. Perhaps they can help you." Starting another conversation with Sir Casimir at this point will have him remind you of the task he gave you: "Seek out the priests in the Chapel of Stendarr. They may be able to help you retrieve the Gauntlets I lost so many years ago." Questioning Sir Casimir about the Knights of the Nine will have him reveal his regret about the fate of the order: "We had only the best of intentions. Truly, we did. We meant only to serve the Nine and the Empire. It's hard to believe it all went so wrong." Asking him about the curse again will have him reveal that the curse lives on in his descendants. "It was placed on me for defying the teachings of Stendarr in his very Chapel. My entire lineage was ruined by this curse. Whether it is connected to the fate of the Gauntlets, I do not know." 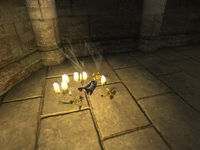 Questioning Sir Casimir about the Boots of the Crusader will have him reply to you by saying, "When Sir Juncan died while questing after the Boots, I mourned his loss. Now, I wonder if perhaps it was a mercy that he left us when he did." After completing the Knights of the Nine quests, his tomb in the basement of the Priory of the Nine grants you Mara's Blessing: "The great mother endures.Mara [sic] grants you her endurance. When all else fails you, look to love for the power to carry on." This blessing grants you an additional five points to your Endurance attribute. This effect is semi-permanent: it stays in effect until you activate another of the Knights' tombs and receive a different blessing. This page was last modified on 1 September 2018, at 09:12.